Prevention is the best treatment for your oral health. It’s the key to a healthy life and maintaining a bright, beautiful smile. That’s why at Kelli Junker, DDS we emphasize oral disease prevention and patient education. We are committed to partnering with you to achieve optimal oral health. During your regularly scheduled check-ups, our highly trained team of dentists and hygienists will provide you with thorough instruction on the proper home care of your teeth and gums and education on oral disease prevention. Your oral hygiene can affect your overall health. Studies show that bacteria in the mouth have been linked to heart disease, stroke, diabetes, and other serious medical issues. Researchers have also found a connection between gum disease and premature birth. Regular visits to the dentist are essential for the maintenance of healthy teeth and gums. During each visit, we evaluate the health of your gums, check for tooth decay and screen for periodontal disease and oral cancer. Your hygienist can provide you with a wealth of information about your oral health. This includes teaching you how to brush and floss correctly, and how to care for your gums. Our hygienists are familiar with issues such as bad breath, teeth grinding, sports mouth guards, sensitive teeth, topical sealants, electric toothbrushes and teeth whitening. While we give you a thorough teeth cleaning on a regular basis, it is your responsibility to maintain your beautiful smile through daily tooth brushing and flossing. 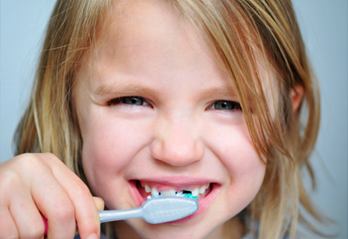 Brush your teeth twice a day with an ADA-accepted fluoride toothpaste. Replace your toothbrush every three or four months, or sooner if the bristles are frayed. Do not use a worn toothbrush as it is not suitable for proper brushing. An electric toothbrush delivers great results if it is within your budget. Hold your toothbrush at a 45 degree angle in order to get in between the teeth and gums. Use a very short back-and-forth motion or a circular motion. Be sure to brush the outsides and insides, top and bottom. Clean between teeth daily with floss or an interdental cleaner. Decay-causing bacteria still linger between teeth where toothbrush bristles can’t reach. This helps remove plaque and food particles from between the teeth and under the gum line. Periodontal disease (or gum disease) is the #1 cause of tooth loss in adults today. It is an infection of the tissues surrounding and supporting the teeth, which is caused by bacteria found in dental plaque. According to the American Academy of Periodontology, this disease may give you a higher risk of having a stroke and heart attack. There are often no symptoms and no pain until the disease becomes advanced. Swollen and bleeding gums are signs that your gums may be infected with bacteria. The early stage is called gingivitis, which affects more than 50% of the population. If gingivitis remains untreated, it can spread within your mouth and lead to advanced peridontitis. Eventually, your teeth will become loose, and they will need to be extracted. To prevent periodontal disease, it is imperative to take proper care of your teeth and gums. Also, the daily use of an antibacterial mouthwash helps to keep periodontal disease away. Periodontal disease is controllable, so we can work with you to manage the control and treatment of the disease! Gum disease silently affects over 50 million Americans. Take this self-assessment quiz to see if you are one of them. If you answer “yes” to two or more of the following questions, call our office promptly. 3. Do you have diabetes? 4. Do you grind or clench your teeth? 5. Are you taking oral contraceptives? 6. Are you under a great deal of stress? 7. Do you have persistent bad breath? 8. Are your gums read or swollen? 9. Do your gums bleed when brushing and/or flossing? 10. Are your gums pulling away from your teeth or receding? 11. Do you have teeth that appear to be loosening? 12. Have you noticed a change in the way your teeth fit together? 13. Have you recently lost a tooth? 14. Is it difficult for you to chew?